This chapter focuses on the principles and guidelines that should be borne in mind when designing and developing some digital elements of interactive multimedia listening software such as ‘unfamiliar items', ‘glossary', aural texts', and ‘speech rate' in interactive multimedia listening software as a part of second/foreign language learning (FLL). The stages of software design and development are categorized into six separate stages: (1) feasibility, (2) setting up a team of experts, (3) designing, (4) programming, (5) testing, and (6) evaluating. 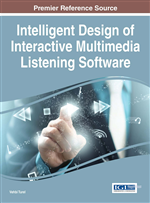 Not only is each stage vital to the design and development process for cost effective multimedia listening software, but the design of each digital element of interactive multimedia listening software at each stage is also fundamental. Therefore, a wide range of principles and guidelines need to be borne in mind at each stage in order to be able to design and develop every single element efficiently.The elements which are the focus of this chapter are:‘unfamiliar items', ‘glossary', aural texts', and ‘speech rate'. Nowadays, when one speaks of ‘multimedia listening software’, mostly one thing comes to mind. It is the use, combination, presentation and instantaneous delivery of sound (audio clips), video (video clips), (reading) text, unfamiliar items (i.e. lexis and syntax), visuals (still or motion visuals - i.e. pictures, icons, logos, graphics, charts, animations, supplementary visuals), glossary, help, instructions, activities, captions, tasks, self-assessment tests, feedback, speech rate, optimum combinations, control buttons, video stage, navigation buttons, hyperlinks/links, answers and so forth on the same platform, which is totally digital and therefore under program as well as learner control. The combination and delivery of different elements on the same digital platform is called multimedia (Turel, 2015, pp. 2495-96). When the combination is provided through links, then it is called interactive multimedia or hypermedia. These links can be in the form of hyperlinks, hypertext, buttons, hotspots or hot-words so that learners/users can retrieve information and/or navigate (ibid: 2496). When interactive multimedia/hypermedia enables language learners to make personal preferences; record these preferences, their individual needs and learning goals; and then uses such preferences throughout interaction with the language learners to meet their personal needs so that they can learn better, then interactive multimedia/hypermedia becomes adaptive hypermedia (ibid: 2497). Adaptive hypermedia is a new direction in the field of interactive multimedia and is made up of different models (Brusilovsky 2012, p. 46; Kahraman, Sagiroglu, & Colak, 2013, p. 60). Since a wide range of diverse digital elements can be combined and delivered in interactive multimedia listening software, the intelligent priority and pedagogical design of such elements in listening applications as a part of second/foreign language learning (SLL/FLL) becomes fundamental. Not only do the most (optimum) effective elements need to be preferred and given priority in order of importance, but such elements need also to be combined and designed in the most appropriate ways so that the target goals can be achieved in true sense. Otherwise, the combination of many different media/elements on the same digital platform can distract rather than aid. To succeed this is mostly dependent on to what degree we are aware of the pertinent empirical findings. We also need to bear in mind the factors affecting listening and listening comprehension (Turel, 2014a, pp. 310-331) and what we aim to manage. Thus, while suggestions regarding the design of ‘unfamiliar items’, ‘glossary’, ‘aural texts’, and ‘speech rate’ in interactive multimedia listening software are put forward, pertinent literature, and pedagogical, physiological and epistemological aspects will be considered.